Read an article from the San Diego Reader click HERE. 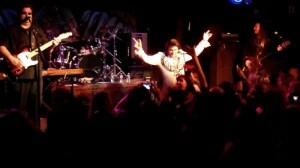 James "King" Kruk channelling Elvis. James Kruk didn’t realize it until much later, but Elvis was on his trail. He remembers traces of the King from his early childhood in New York in the 1970s. Elvis Presley by that point had transcended mere coolness and had become what qualifies as royalty in the United States. Gone were the heartthrob movies of the ‘50s and even the cool black leather from his famed Vegas comeback show of 1968. Elvis had donned a white jumpsuit, and he wore a cape. His family was more Led Zeppelin inclined, but his sister had a 45 of “Suspicious Minds” that captured Kruk’s attention. Yet it wasn’t for another two decades that Kruk actually communed with the King. He’d attended UC Santa Cruz as a theater major and was a bass player in a couple of rock bands who had a theatrical bent – first The Butchers, and later, Fake Booby Judy. In 2001, Kruk received his first break as an actor when he was cast as Elvis in Steve Martin’s “Picasso at the Lapin Agile,” a play in which Picasso, Einstein, and the King meet in a Paris café. Kruk didn’t really have to sing in the nationally-touring production. But he had to learn how to do what Elvis did better than perhaps any other man who lived in the 20th century – the fine art of making an entrance. The trick, in other words, was to be beyond cool – not to try being Elvis, but to be Elvis. It was a piece of knowledge that would change Kruk’s life in ways he couldn’t have fathomed. The play toured for two years, and afterwards Kruk ran into some turbulence – heartbreak, divorce, and a journey out of the country. He went to Poland to teach English and pull himself back together. Elvis followed him. In Poland, Kruk met the woman who would become his true love – his current wife, Alex. Elvis helped him woo her. Kruk somehow found himself entered in a karaoke contest in Krakow. The only thing he could think to do was Elvis. The crowd went so wild it startled him. They made him sing every single Elvis song on the karaoke machine and he won the contest – grand prize was Russian champagne – and suddenly become one of Poland’s top Elvis impersonators. He and his wife eventually moved back to California, first to San Diego and later Redondo Beach. Acting gigs were hard to come by, and the couple was struggling financially when his wife persuaded Kruk to enter an Elvis competition. Kruk scored first place at the Del Mar Fair – beating two established Elvis’s – and never looked back. Kruk finally embraced his destiny. He couldn’t run from it any longer – he was born to be Elvis. He bought a jumpsuit online and booked a gig at a Mormon ‘50s night in San Clemente. The crowd didn’t exactly go wild, but afterwards he was treated with a strange reverence as he posed in photos with children and signed autographs. He’d officially entered the Elvis world. Kruk, who headlines Saint Rocke’s celebration of Elvis’s birthday on Friday night, has since become one of the premiere Elvis’s in Southern California. His gigs vary wildly – from corporate functions alone with his jumpsuit and sound machine to full-on theater gigs with his full band – and one in particular gave him an unofficial benediction of a sort from the Elvis world: he played a housewarming party thrown at Elvis’s former mansion in Beverly Hills, which a millionaire Elvis fan had recently bought. Among the guests was Elvis’s former girlfriend, Linda Thompson, who sat and chatted with Kruk before and after he sang. Musically, Kruk has transcended mere impersonation. 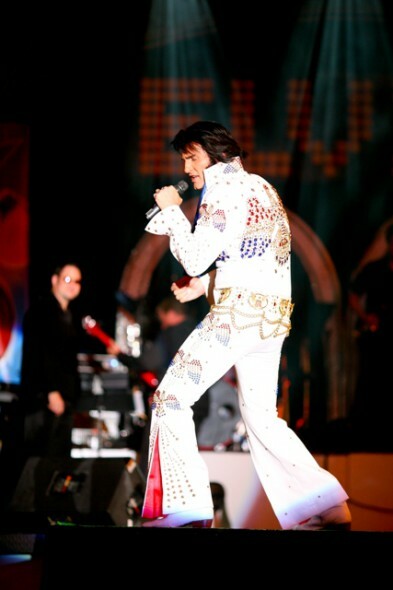 The current word used for bands that perform at this level is “tribute,” and it’s apt in this case – because what Kruk delivers isn’t karaoke, but a chance for audiences to capture a live glimpse of the musicality and stage presence that made Elvis the King. Elvis, aka James "King" Kruk, communes with his fans. 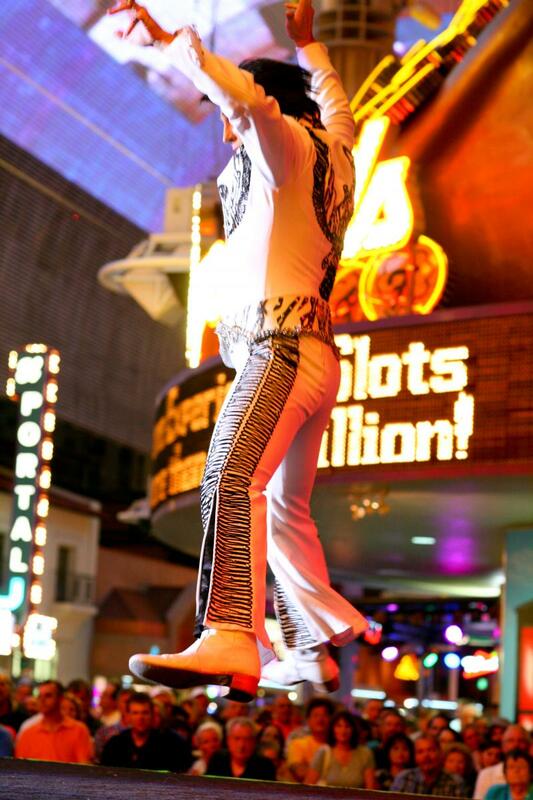 And, of course, there are the fringe benefits that come with being Elvis.